Coverage increased (+0.2%) to 58.982% when pulling d8993c1 on h3-layers into 5aa5714 on master. This looks great and will help us a ton, thanks @Pessimistress! Does ColumnLayer handle calculation of normals based on vertices in the primitive geometry? Not yet, it currently assumes that normals are close enough to the regular polygon. We do not render normals correctly anyways (normals are interpolated instead of flat for each side). Unless we have some other good ideas, the standard solution is to duplicate vertices for the edges. Since this leads to a bigger geometry, we may want to have that as an option/prop on the ColumnLayer: shading: 'flat' or shading; 'smooth'. 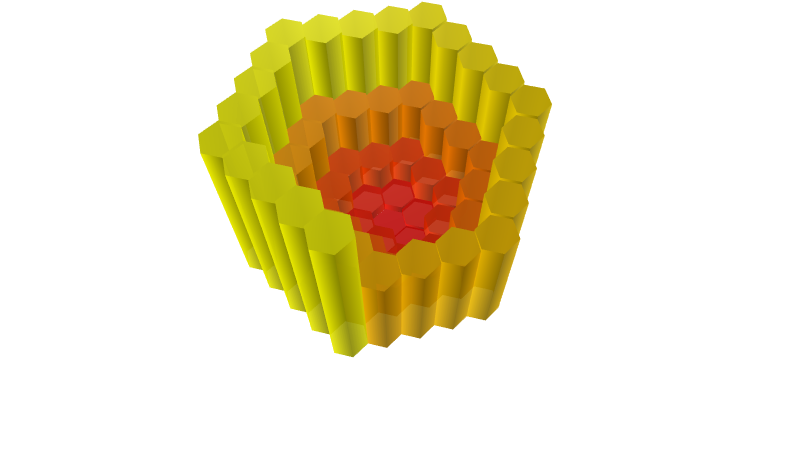 The ColumnLayer is currently using CylinderGeometry from luma. I feel this option needs to be added at the source. That could make sense. Opened luma issue uber/luma.gl#994, so that deck can reference this in a follow-up tracker ticket for the H3 layers. is it possible to add another getCoverage accessor? Yes? What is the use case, do we need different coverage for each hexagon? Will do in a follow up PR. Looks quite thorough, nice work! The best validation of the updates would be to update internal apps to use the open source versions. Do we want to give ourself some freedom until then by marking these as experiments (could just be marked after title, no underscore or similar)? The H3ClusterLayer Layer renders regions represented by hexagon sets from the [h3](https://uber.github.io/h3/) geospatial indexing system. Perhaps worth auditing the naming with H3 folks. At the time I was working with the library, a cluster wasn't a thing, maybe there is a term that fits better? * Each hexagon in the H3 indexing system is [slightly different in shape](https://uber.github.io/h3/#/documentation/core-library/coordinate-systems). To draw a large number of hexagons efficiently, the H3HexagonLayer assumes that all hexagons within the current viewport have the same shape as the one at the center of the current viewport. This strategy is usually sufficient. However, the discrepancy may become visually significant at rare geolocations. In that case, the [H3ClusterLayer] can be used as an alternative by trading performance for accuracy. In spite of being a composite layer, this only handles one H3 aperture, maybe mention that? Top aperture has mix of hexagons and pentagons, comment that this is not covered? It is mentioned in the description of getHexagon. If I can interject, every aperture has a mix of hexagons and pentagons. The pentagons have simply been placed in water so common use-cases do not run into them. This will require some changes in the ColumnLayer, will do in a follow up PR. Do you have a hex id I can test with? Sure. One example pentagon at resolution 9 is 891c0000003ffff. You may also want to run a kRing of 10 or 20 around that pentagon, since pentagons are at the epicenter of the hexagon distortions and you're going to run into essentially 5 different hexagon shapes in that area (one for each of the icosahedron faces the hexagons are on, and technically some really weird ones that are split across the icosahedron boundaries). Nit: I think we should have a separate index rather than duplicate layers in two places just to get an alphabetic list. An index could be easily auto-generated by ocular once we port the deck website after v7 release. The docs should just contain folders corresponding to the modules. If keeping this. Do we want to add an H3 version badge, similar to what we have on the binding readme: http://github.com/uber/h3-js? Honestly even the major version of the library shouldn't matter, as long as it's the same index version. What happens if this is a pentagon? Discussed offline with @Pessimistress - the responsibility is on the user to use this fast version only if they're willing to deal with occasional issues arising from pentagons and crossing icosahedron edges.